The UK press works closely with the UK intelligence services. They have done so for decades and it’s widely acknowledged although not widely publicised. In exchange for small snippets of real intelligence, which the journalists use in their reports, they are expected to publicise disinformation fed to them by their contacts in the security and intelligence services. It’s part of the myth of a “free press” whereby the media is guided and controlled to serve special interest groups: like the oil industry or the Jewish lobby. In the guise of journalism, this is then swallowed by the public as “news”. Think of the multitude of stories about Saddam’s Weapons of Mass Destruction, which were a stock item in the media prior to the 2003 Iraq invasion. They conveniently prepared the public for the invasion by inducing a “something must be done” attitude toward Iraq. After the invasion was over it became apparent that Saddam didn’t have any WMD but by then it was too late. The stories had done the job and helped pave the way for the invasion, as intended. The Evening Standard report below is of a similar type and it was probably compiled in response to requests by the ‘security services’. Recent reports that the vehicle that rammed security barriers outside Parliament was followed had to be countered. If only because they imply the involvement of the security services in the incident, and by extension to a wider range of terrorist incidents. This is the last thing the powers that be want, as it threatens to expose their “War on Terror” for the lie that it is. To make matters worse, the security services simply cannot deny that Salih Khater’s vehicle was being followed because there is CCTV footage that suggests as much. So corporate media journalists, or their friends in intelligence, have dreamt up a story about how the white van that followed Khater’s vehicle was actually trying to “stop” him. It’s a key feature of disinformation that its sources and informants aren’t identified. This way when others try to verify or disprove a story they cannot because they don’t know the origin of the information behind the story. Accordingly, the Evening Standard doesn’t name the driver involved or identify any of their informants beyond describing them as “security sources”. 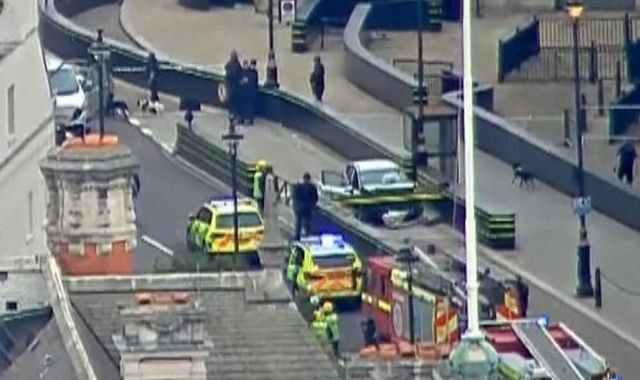 Nor does it explain how this unnamed driver knew that Salih Khater intended to crash his vehicle into Parliament when Khater was still some distance from the building. The unnamed driver who followed Khater only wanted to stop him, or so the Evening Standard claims. But how did the unnamed driver know what Saleh Khater’s intended to do? Was he psychic? How did he know what Khater’s plans were? The Evening Standard doesn’t say. It doesn’t add up because the very people and organisations that are supposedly fighting terror are actually orchestrating it. It would ruin this centuries-old conspiracy if this were revealed. So the following article is meant dispel any notion that the ‘security services’ are working with terrorists. Ed. 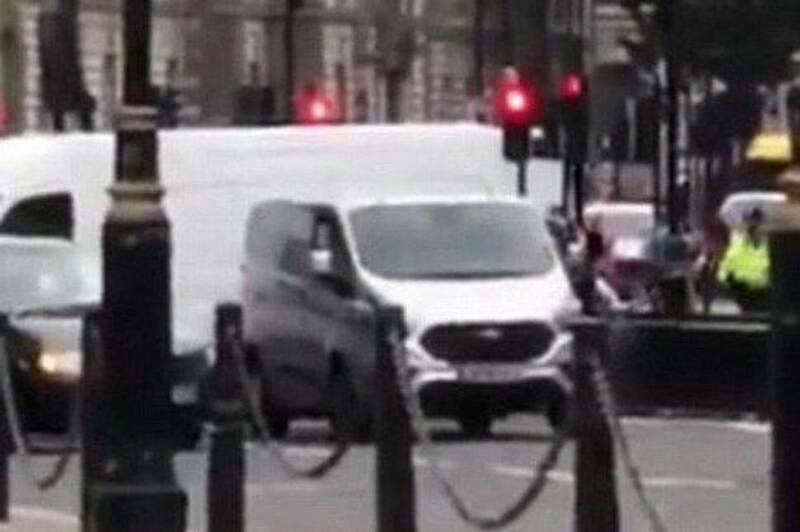 A mystery white van seen pursuing the alleged terrorist who drove into cyclists outside the Houses of Parliament was a member of the public trying to stop the attack, it emerged today. The unknown male driver of the Ford Transit van spotted suspect Salih Khater’s car veering into the security lane and immediately changed direction to give pursuit. He raced after the suspect but became stuck behind another vehicle as Khater’s Ford Fiesta smashed into a security barrier. At first, there was speculation that the mystery van was a police surveillance team who were secretly following Khater. However, security sources confirmed that the driver was a member of the public who wanted to help. Detectives have been granted more time to question Khater, 29, as friends and associates described the crash as “an accident” with one claiming the asylum seeker suffered a panic attack. The British national, originally from Sudan, was first held on a terrorism charge and later additionally arrested for attempted murder. He remains in custody at a south London police station and Scotland Yard said Westminster Magistrates’ Court yesterday granted the force a warrant to detain him until Monday. The Fiesta used in the incident was driven from Birmingham to London late on Monday and spent almost five hours in the Tottenham Court Road area. It was then driven around Westminster for more than 90 minutes before crashing into the barrier just before 7.40am on Tuesday. Friends and family have described the suspect as a “normal person” who was recently granted British citizenship who had shown no links to radicalism. The suspect’s brother, Abdullah Khater, told the BBC that their family, who are originally from Darfur, were in a “state of shock”. Residents who knew the former accountancy student at Coventry University have described him as a quiet man who frequently visited the Bunna Internet Cafe on Stratford Road in Birmingham. Today one friend, Dr Mahdi Mohamed Khair, told LBC’s Nick Ferrari programme that Khater was a “polite, friendly young man” who played football twice a week.